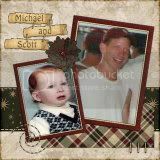 Grief and Bereavement forum groups • View topic - Today Im just feelin the lump in my throat again..
Post subject: Today Im just feelin the lump in my throat again..
For some reason today I have thought about the day my son died. over and over it is replayin in my head and im not sure why at all. I feel like I cant stop moving or thinking about ANYTHING or ill relive that day again and it hurts just as bad as it did that day. I can remember every detail and it bothers me becuase there are times i cant remember what i even ate in a day. but for some reason i can remember every aching moment of my son's death. why is it that something so painful is the thing you can remember most. I am so heart broken today and sometimes its so hard to see my step daughter because she is not mine and her and my son shared the same daddy and i see alot of him in her...does that make me a terrible person?. I just want my son back I want to hold him and keep him safe like i should have been able to..i feel robbed and i just want the pain to go away..even just for a day so maybe ill feel some peace..can anyone relate to how im feeling? because I can really use some insight..
Post subject: Re: Today Im just feelin the lump in my throat again.. I can understand how you feel.After my son Michael was killed, it played over and over in my head for the longest time.I felt jealous of other parents who still had their sons wondering why God had to take my son.All of these feelings are normal. What has really helped me is talking with other greiving parents that have been thru the same loss,only they can truley understand what we are going through.Also keeping a journal of your journey, feeling thoughts etc. can help with the greiving . We all have good days and bad days which is why I take it one day at a time.This journey we are all on is tough,but we are all in it together.